September | 2015 | drcelucienjoseph, "Thinking and Meditating"
We are not Ahmed Mohamed! You see, the student’s name (Ahmed Mohamed) is associated with a religion, a culture, a lifestyle, and even a worldview or a system of thought—all of which are marginalized in the American society. Secondly, the crisis of white supremacy and the arrogance of race in our culture have made him paradoxically an “invisible young man” and a “target” in our culture. Yet, the greatest threat to Christianity in America and American freedom is not Islam nor Islamic culture; It is right-wing Christians, and right-wing Christian (-inspired) political movements and politicians. What if his name were “Dunn Carpenter,” or “Curtis Montgomery,” would he have received the same treatment from the hands of the Dallas Police or his school administration and teachers? What if Dunn Carpenter or Curtis Montgomery were that fourteen-year old young man who has invented the homemade alarm clock and brought it to his high school teachers to showcase his engineering talent and interest in science? Ahmed Mohamed and his parents are not “Christians.” They are Muslims by confession of faith. Unfortunately, he was seen by the administration of his school and teachers, and by the Dallas Police community as a possible danger to society, a threat to American freedom, not as a product of American progress in science or interest in technological innovation in the 21st century. You see, I’m speaking from the perspective of a parent—a black father and black male—who is raising two American black boys, and one of them wants to go to the field of engineering and become a scientist. In fact, he wants to get a PhD in Physics at MIT. 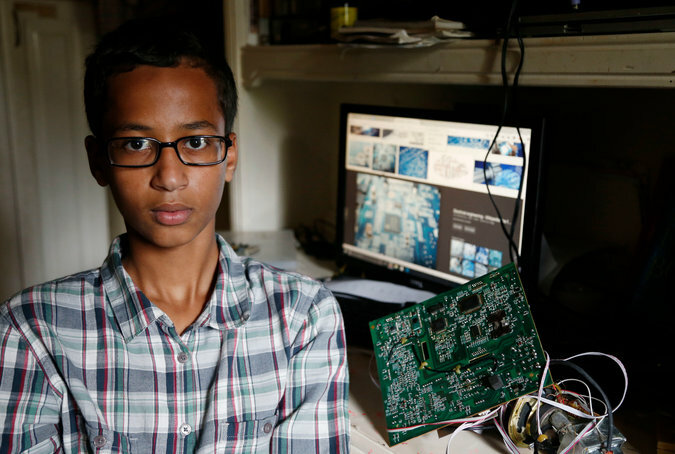 Ahmed Mohamed could have been my son, and I could have been his father. Would this young Muslim and color boy grow up to “love” America? Would this young Muslim and color boy grow up to “forget” America’s Islamophobia? Would this young Muslim and color boy grow up to “forget” America’s racist mistreatment toward him? Could this young Muslim and color boy sing: “I, too, Am America”?